Fall is one of my favorite times of year. 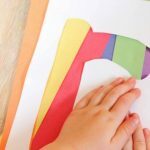 Enjoy practicing the alphabet with this free fall color by letter preschool printable activity. 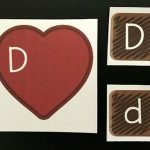 Grow alphabet recognition and celebrate autumn together! Raise your hand if fall is your favorite season. I put both hands up if that tells you anything. 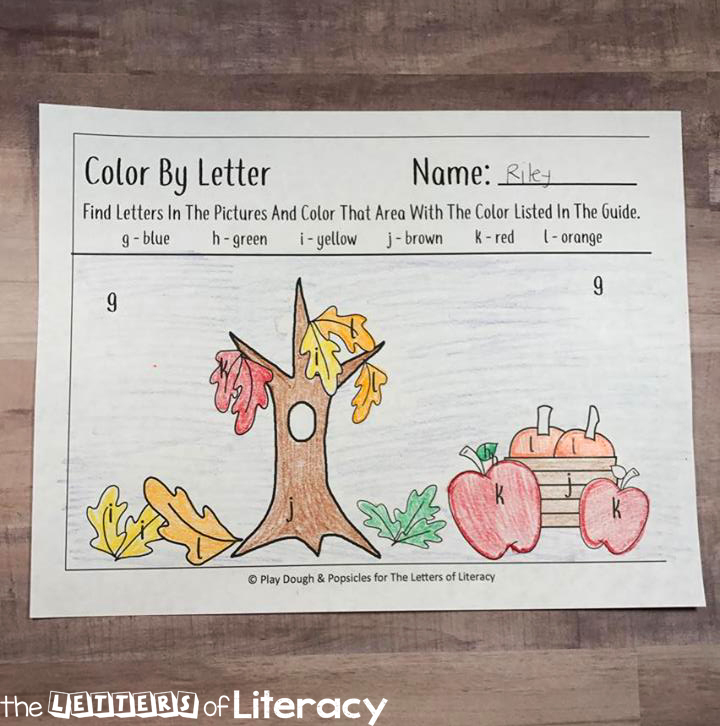 I love all the things when it comes to fall, including fun activities to help my daughter learn and practice letter recognition! This is much like our Back To School Color By Letter and Beach Theme Color By Letter printables but this time it is Fall Favorites Color By Letter. So if you and your kids are Fall fanatics like we are, this is sure to be a hit! Fall is just my favorite. I enjoy watching my daughter get excited about carving pumpkins and decorating with fall leaves. I love wearing boots and scarves and when I can do that it means the temperatures have turned cool and I wouldn’t want it any other way. 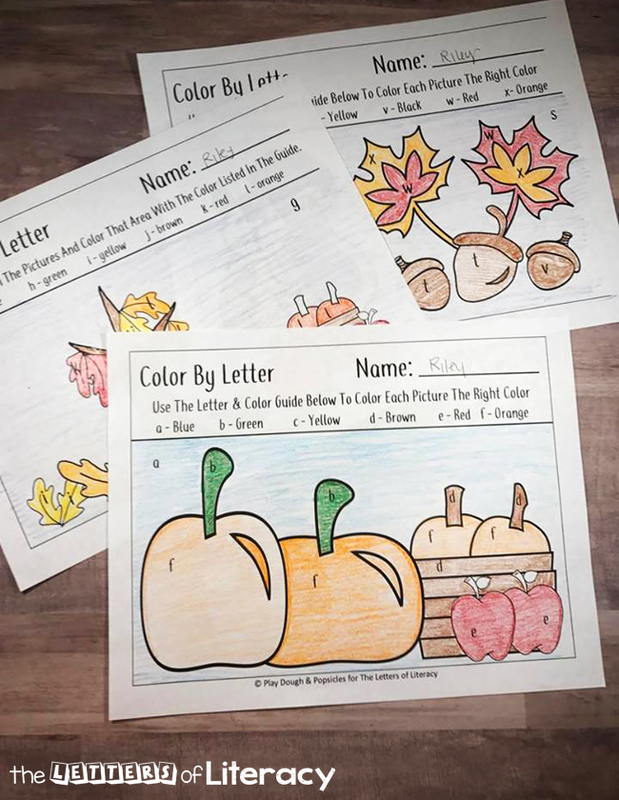 These color by letter printables remind me of all my fall favorites: pumpkins, apples and leaves. Plus cute baskets to hold all the fun things too! I like to create activities for my daughter that are based on things that we are surrounded by at that moment. It seems that when learning activities are based on a child’s interest or something relevant to their lives, it helps keep their interest more. 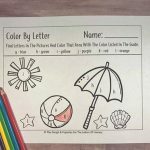 To start you’ll need the free printables, which you can download below, as well as your child’s favorite coloring utensils. Do your kids go through phases of their favorite art supplies? Mine does. Today we were into crayons, so we used them. There are three different pictures in this set but a total of five coloring pages. I used all 26 letters of the alphabet plus doubled a few that can easily get confusing. This just provides a little extra practice for those letters. You will notice that some letters are repeated, such as b, p, d, and q. That is because these letters are often tricky for students since their strokes and look are so similar, so they are repeated on separate pages to provide more practice. Unlike the Back to School and Beach themed color by letter, which were more primary color focused, this set is focused on Fall colors. Brown, orange, yellow, red, blue and black. So fun, right? Each color is assigned to a different letter which can be found in the grid. Under the grid is the coloring page. 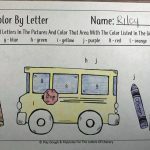 Each image on the page has an assigned letter. This way kids will know which color to choose for which part of the picture. 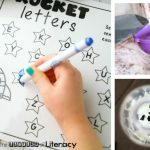 For kids who aren’t ready to read the color words yet, I suggest using the coloring utensils to color of the color word with the one that correlates. 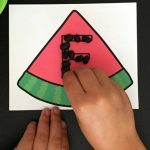 This activity helps children at many different levels with letter recognition. 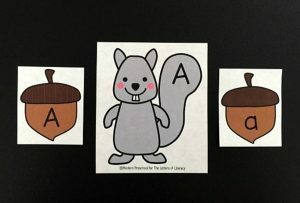 This is a simple yet exciting activity that can encourage children to learn each letter and recognize the differences between the two. 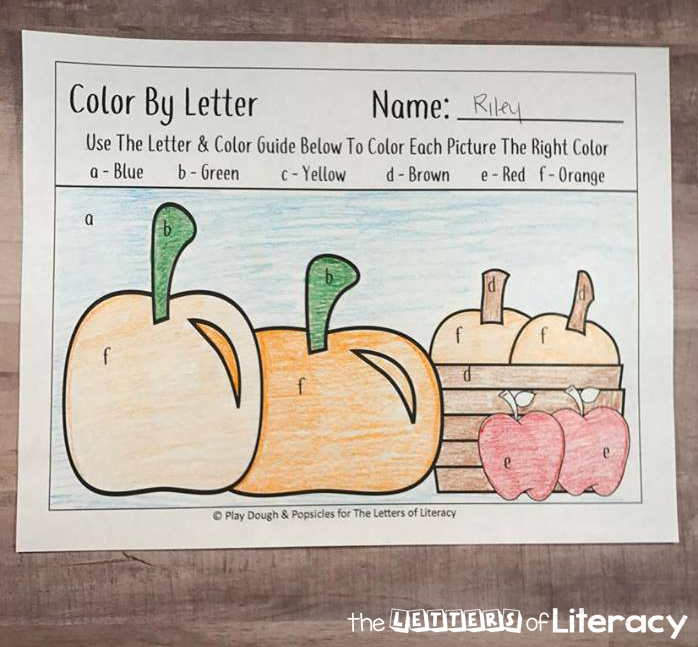 Besides letter recognition, this activity is also fantastic for strengthening pencil grip, strengthen hand muscles, practice coloring in the lines, and get kids excited for Fall! If your child, or students, need more of a challenge, you could incorporate some or all of the following. 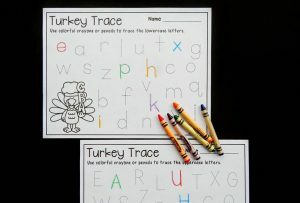 Ask child to sound out the letter before coloring in the area. 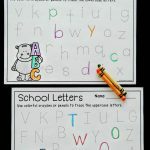 Ask the child to write the letter on a separate piece of paper. Ask the child if he/she knows any words that begin with the certain letter, if so ask him/her to say them or even write them on a separate piece of paper. 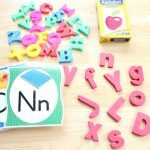 Ready to practice your alphabet? 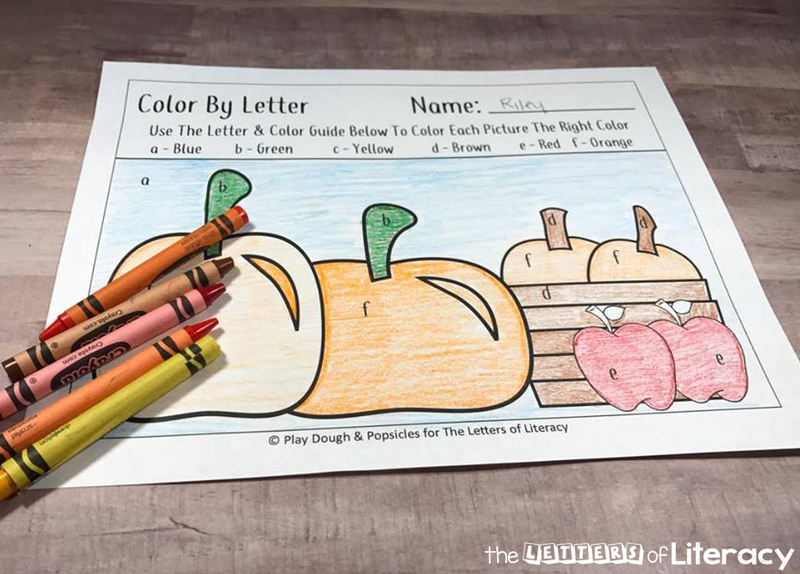 Download your copy of the fall color by letter printables by clicking on the blue button below. 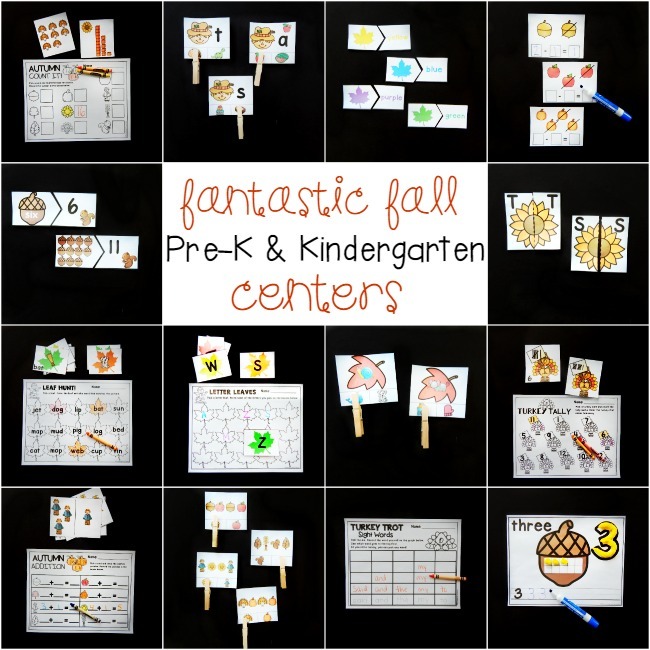 Then, for TONS of fall themed fun, hop on over and grab our fall math and literacy centers! Deanna Hershberger is a work at home mom, coffee obsessed, a diy addict and a Netflix binger. She spends her days playing and making with her daughter and enjoys quiet nights at home with her husband. She shares all of this on her blog, Play Dough & Popsicles.